Uh Oh… time for report cards. 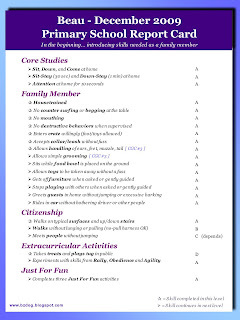 Beau: Beau’s report card is pretty much as I would have expected, mostly because he already knew the Primary School Curriculum except for the Just For Fun activities. Family Dog and Core Studies - As I’ve mentioned before, he’s a great family dog in the house and his grades reflect that - straight A’s for both! Of course, as a six-year old dog, you would expect him to get A’s there! 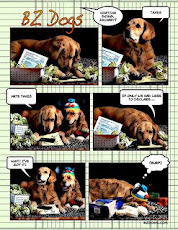 Citizenship – Oh dear… Beau’s Achilles’ heel if there ever was one, despite his Canine Good Citizen Certificate. I didn’t really try to work with him on any of these, and not surprisingly he didn’t get better. Sometimes we just need to accept the dog we have, and my dog treats everyone as his Long Lost Best Friend. I suppose there are worse things than a dog who loves everyone. Extra Curricular Activities – Yes, he got a ‘D’ for (lack of) eating and playing… the key problem being it must be done in public. I spent several years trying to “fix” this before Zachary arrived, sort of fixed the food problem with much effort (although I let it slide after he “retired”) and now I’m content to accept the dog I have. At least I knew he’ll never knock anyone down just to get their food or a toy! 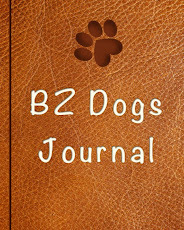 Zachary: Zachary’s report card, also covering 2009, takes him from a 9-month-old puppy to just shy of two years old. Not surprisingly, I saw much growth in all areas during that time. He’s been in dog classes for pretty much the whole time - from a long run of Family Dog classes, to Agility, to Tricks for Fun, to Rally. What a busy boy! His grades aren’t as good as Beau’s, but he hasn’t been working on this stuff for six years either. Core Studies: A’s – although he still has troubles with attention. Ah, youth. Family Member: Mostly A’s, with those that aren’t being a product of him being an active young dog still working on self-control. The jingling of a leash turns him into a whirling dervish, he squirms when being groomed, wiggles and paws while in the car, and loves his Uncle Beau so much that it’s sometimes hard for him to hear me telling him to give it a rest. Citizenship: He’s actually pretty good. He’s not a pro at loose leash by any stretch of the imagination, but I can walk him on a thin leather leash hooked over a few fingers. He picked up one B as I just recently discovered he goes up short flights of stairs by taking them in a single bound – oops, my bad, never worked on that but it’s on the list now. Extracurricular Activities: No problems, all A’s. Just For Fun – He learned to weave between my legs, walk backwards, bow, push the “Easy” button, spin, shake, pull a laundry basket, unload the drier, and pull a tissue from a box. Not bad… not bad at all! As the New Year dawns they move on to Middle School. I’ll try to post the curriculum in the next few days. I’m struggling with the wording/content of single line (under Extracurricular Activities) and once I settle on what I want, up it goes. I have a confession to make: I think I might have cheated on one of my dogs' tests. I don’t think it’s because I’m a dishonest person… at least I hope that’s not the problem. There is certainly nothing to be gained by cheating, nor is there anything lost by failing to cheat. My dogs are “just” family members, will never be certified to be or do anything, will never enroll in anything demanding references, and will never have to produce a transcript. I have no deadlines to meet and no clients waiting. And yet the nagging feeling that I did something not quite right remains. When I’m ready to test my dogs, the usual routine is to pull out the video camera, set it up, and then look over my notes one last time to make sure I know what I’m testing. The night in question it was “Distance”. I like to test first and then teach new things, as I figure that way my students are showing they know the test item(s) “cold”. That night I turned on the camera, grabbed some treats, and walked to the test site with the plastic cone I was going to use for that test. My selected student (Beau in this case - Beau always goes first) followed me with rapt attention. I took a nice deep breath, looked meaningful at my dog (who appeared ready as he was looking back up at me) and then I pointed one arm at the cone. Beau trotted right over and touched it with his nose. Back to the test site I went, another deep breath, dog seated, and I suddenly had a light bulb moment. 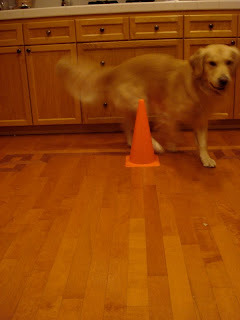 I held my arms still, looked meaningfully at my student (once again looking up at me) and I said “Around!” Beau dutifully got up, trotted around the cone, and returned. Or was it? At the time, I rationalized that it was. I told myself I had simply not realized which part of the command (signal or voice) Beau actually knew. That particular test required just one cue, and I had just guessed poorly which one to give. It had been a while since we last worked on it, and it’s not like I gave any additional hints or tuition. I played with it a bit, mixing up sits and downs and arounds - just to be sure he wasn’t guessing - and he was perfect. It was now Zachary’s turn. I started right off with the word “Around!” - not going to catch me making the same mistake twice. Zachary immediately ran over, touched the cone with his nose, and hurried back. It turns out Take Two was perfect. 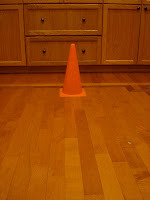 I pointed toward the cone and Zachary zipped around it. It was one cue, and one cue only; it just so happened that he preferred a signal to Beau’s verbal cue. That’s when I remembered that Zachary had made that very same “mistake” a few months back when I was first teaching this (and I even showed it in my 10 Reasons video. D’oh!) I again played with it a bit, mixing things up with sits and downs, and after that initial hiccup he was perfect. So chalking it up to me being a horrible instructor, I crossed Distance off my list. Woo Hoo! Which brings us at last to the topic of this post: As I looked through my footage awaiting compilation into a movie, I began to wonder if what I did was, in fact, cheating? I found myself wondering how many other times I have dismissed initial failure as “dog wasn’t ready” or “I didn’t do the test right.” I’m really not sure. I can’t think of any off-hand, but with as many videos as I’ve taken and the ease with which I justified the above, I have to concede to the possibility that there might be more. I rarely keep the original clips once the movies are finished so there is no way to know for sure. In the grand scheme of things, of course, none of this really matters. The Zachary Canine Curriculum Certification Committee (uh, that would be me) isn’t going to take my license away, my dogs aren’t going to have their names splashed across newspapers or be brought up for disciplinary action. But it does sort of defeat the purpose of tracking progress if you aren’t going to bother to do so accurately. So, I decided it was time to take a stand. I am now instigating the One Take rule for all tests. Barring the camera falling over or my pants falling down, I am going with whatever the first take is. If success, Woo Hoo! If failure, then I shall have to try again another day. For the curious, this week’s Weekly Worksheet is now posted, offering many opportunities to test my resolve. I made a rookie teaching error this last week. Well, I’d like to think it was a rookie error, although truth be told I’ve been in (bad) dog classes where the instructor has made the same mistake. It began innocently enough. The task was to get Zachary to stand right in front me with his nose pointing straight toward me and his tail pointing straight away (Sue Ailsby’s Training Levels Three - Front) Simplicity itself, right? We began in the usual way. I stood in the kitchen with a clicker in one hand and bunch of treats in the other. 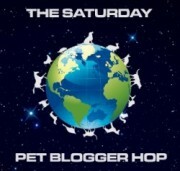 I then visualized the final product (Zachary as a compass needle) and tossed a treat behind me to get things started. While Zachary dug around under the cabinets for his morsel, I refined my mental picture a bit. I was now standing on an imaginary line running left to right. As soon as Zachary crossed that line while heading back to my front I would click and treat. Sure enough, after Hoovering up the first cookie and find no others, Zachary came trotting around to see what was up. As soon as his feet crossed my imaginary line I clicked and tossed another tidbit behind me. We repeated this for a while with excellent results. Once I could see he was really hooked on the game, I bent my mental line at my feet, reducing his 180 degrees of success to about 120 degrees. No problems. When he didn’t come around far enough and I didn’t click, he just took another step – “Hey Mom… Hellooooooo… anybody up there?” Click. Treat… we were doing great so I called it night. Might as well end on an up note. The next day I decided to changes things up a bit. 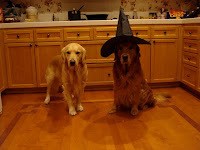 Same goal, of course, Zachary as a compass needle, but now I was tossing the treat behind him instead of behind me. I was hoping this would keep his body straight vs. wrapping around my leg like some furry, carnivorous vine. Worked like a charm, he came in straight as an arrow. I figured I’d be videoing this one in no time. On day three I got fancy and turned a bit so I could toss the treats off to the side. Yes, I did try it the first time without turning and ended up on my hands and knees digging a pea-sized dog treat out of the fridge grill. Ewww. And thus I made my rookie mistake. I neglected to consider my student when applying the instructions. Now had I been working with Beau, those instructions would have been dead on accurate. Clicking while Beau was stationary (or heaven forbid seated) would have created a nearly impossible to budge statue in short order. But as my good instructor is forever reminding me, Zachary is not Beau. And so, while I thought I was teaching Zachary to move increasingly closer to front, what I was actually taught him was that shifting a little bit this way and a little bit that was what Mom wanted. Before I knew it, I had dog that would NOT stand still. He tiptoed to the left, sashayed to the right, one step forward and two steps back. Sue summed it best when she labeled him “Dancing Zachary”. Arg!!! I just wanted to Velcro his paws to floor. So it was back to the drawing board. The new improved (Zachary specific) criterion is now standing STILL. Perfectly STILL. Like a rock STILL. So long as he is within about 30 degrees of center either way, and STILL, I click. A straight on front gives him a jackpot. Just the other night I was standing in front of the TV, awaiting the pasta to boil, having just cut up some Jarlsberg cheese. Zachary loves Jarlsberg cheese. But my Zachary, standing STILL as a tree. ‘Till perfectly fronted, not a fault to be found! I just uploaded Beau's final Sue Ailsby's Training Levels Two Video (part 6) this evening containing my most boring video yet: Leash Manners. I think multi-minute activities are going to have to be edited down in the future. This one makes watching paint dry seem down-right exhilarating. For those playing along at home, here's the final list, with the "Part" links taking you to the actual videos. ... and it's on to Level Three! I find the hardest part about Homeschooling my dogs is getting off the sofa. I don’t mean getting my dogs off the sofa. That’s easy. Even if they didn’t know the word “off” (which they do) or understand what it means when I point (which they do) the telltale rattling of the treat jar would bring them running. 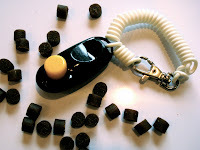 The telltale rattle of their leashes also brings them running. In fact, the telltale rattling of just about anything brings them running. Where was I? Oh yes, lounging on the sofa. The sofa isn’t a problem when you have to go to a class. For one thing, there’s the embarrassment factor. If you don’t practice during the week then the following week everybody is going to know. Oh sure, they’re going to pretend they don’t see. They’re going to act like they are too busy keeping Spike from peeing on somthing or Killer from attacking other dogs to notice, but you know they know and of course the instructor is certainly going to know. Then there is the financial aspect. Having spent $100+ on a six week class (compare to $26/unit at the local JC or $78 for a typical 3 unit class) I feel some at least some sense of obligation to do my homework. There is also a lot less responsibility when you are in a class. There is nothing to plan for or schedule, no notes or thoughts to organize. In fact, as far as I can tell, a sofa is of no use whatsoever when you are enrolled in someone else’s class. That isn’t true when you are in charge of your own dog’s education. In fact, not that long ago I was snuggled on the sofa moving my Middle School curriculum into PowerPoint (it looks so much prettier there.) And just before that, I was tweaking my strategy (again) for preparing for the Canine Good Citizen Test. I spent one whole evening constructing that beauty. I bet you can't guess where. You see, the wonderful thing about being on the sofa is that everything I create there holds such promise. It’s like springtime when you buy those little potted plants and stuff them in the ground. The future may contain drought, or snails, or puppy dog tails, but for one, brief shining moment, that portion of the yard is beautiful. The same is true for plans made on the sofa. In fact, as long as I stay on the sofa, I can imagine a world where fronts are always straight, stays are never broken, and I am finally more interesting than dirt. Once I get off the sofa and put my plans into action, I know things will invariably begin to crumble. Skills I had counted on will have somehow evaporated, bad habits (usually mine) will make things harder than they should be, and unrealistic expectations will become apparent. Meanwhile, as I contemplate whether it’s better to have taught and failed then to never have taught at all, my dogs lie about awaiting education, no doubt wondering what it takes to get me off the sofa. There is a pair of Canis familiaris curled up on my sofa. Standing 24” at the shoulder and weighing in a 70-80lb apiece, they are formidable carnivores with sharp and pointy teeth, muscular bodies, and the ability to run circles around me without even trying. And yet I do not fear them. 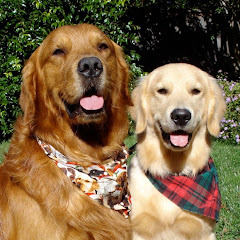 Those selective breeders have produced an animal primed to learn, eager to please, and desiring attention and affection to the utmost degree - at least it did in the case of my Golden Retrievers. What I do with those attributes is entirely up to me. Human offspring come with those very same attributes, and over those same centuries society has developed both methods of teaching and a body of knowledge that needs to be taught. Obviously, this knowledge morphs and grows with each succeeding generation, but the fact that children should respect their elders, get along with their peers, can be taken places without being an embarrassment, and ultimately learn the necessary skills to become useful members of society is as true today as it was when Lord Tweedmouth began breeding golden-furred dogs with sound temperaments and a desire to retrieve. 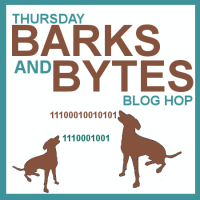 Even worse than the titles of the books, is the sameness of their content: sit, down, come… useful skills to be sure, but just a fraction of what it takes to turn a dog into a Family Member. And isn’t that what most people want - a Family Member? That is certainly what I want – a dog to share my life and my home, who respects me as their elder, gets along with my friends, can be taking places without embarrassing me, and has the necessary skills to be a useful member of the family. 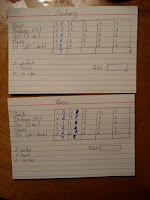 So, now you know the perspective from which I created my Canine Curriculum for Zachary. Following the style of education for children, I titled the first skills Primary School, then added Middle School, and finally Secondary School. I felt that Primary School contained the bare bones minimum needed for a dog I could live with. Middle School and Secondary School expanded on earlier concepts. The end result would be (hopefully) a dog who would make a wonderful Family Member. As an example, on the right is what I included in Primary School. You can click on the image for something big enough to read. You will note that I made no mention of HOW to teach those things. That is because I wasn’t trying to create a dog TRAINING guide, but rather compile the skills and experiences that I felt my dog needed in order to reach maturity. For the curious, I chose Clicker Training (hey, I didn’t name it) as my primary method of teaching. Zachary is a “soft” tempered dog and he seems to be flourishing with that form of education. I have no doubt that I will be creating additional curricula (think College or Trade School) but those will have to wait until Zachary’s true potential becomes apparent. Just as I cannot foresee the path my son will take in life, Zachary’s future “occupation” remains a mystery. But no matter what he ends up doing, be it Rally, Obedience, Agility or something I have yet to consider, I know he will always be a loving and well-loved member of my family. My guess is that most people do, although I'm not sure how many people actually think of it that way. I know I didn't... at least not with my first dog. I took him to many classes, went through several training styles and even more instructors before I finally found a great one, read a ton of books, cried some tears of frustration, talked to a lot of people (not easy for this introvert) and frequently wondered why I seemed to be doing everything wrong. I even had a person offer sympathetically (at least I hope that was the intent), "He's your starter dog," as if that was explanation enough. Starter Dog? What the heck is a Starter Dog? Four years later, when dog #2 came into our lives at just shy of 8 weeks old, the sweetest little bundle of golden fur on the face of the planet (yes, I'm biased - get over it) I vowed I would do better. I reread all my old books, rethought all my previous classes (with afore mentioned Starter Dog) and came to the sad realization that owners are often clueless about the long term and are desperately seeking a "quick fix" to the problem of the day, most books are geared toward giving people what they think they want or need, and far too many instructors are incapable of teaching others how to train their dogs. And so, feeling the heavy burden of educating the little bundle of joy (piddling at my feet) the right way I thought, "Great. Now what?" I knew if I was tasked with homeschooling my child (and yes, I did consider it - but thankfully (for him) only fleetingly) I would first take a look at what the law required. Fair enough. In my state, the law required... a rabies shot and a dog license. Weee! I was done, woo-hoo! A child attends school. The school follows a curriculum to make sure it provides the right courses and meets the state standards. Wikipedia defines curriculum as "the set of courses, and their content, offered at a school or university." It further states, "As an idea, curriculum stems from the Latin word for race course, referring to the course of deeds and experiences through which children grow to become mature adults." Substitute "puppies" for "children" and "dogs" for "adults" and that's exactly what I needed - a curriculum. A canine curriculum. In a nutshell: A plan. Not surprisingly, I didn't find much when I googled "Canine Curriculum". The AKC's Canine Good Citizen CGC certificate is one of the few that showed up. A good start - Starter Dog had his CGC - but that's more of a test than a plan, so I kept looking. Not to be deterred. I sat down and came up with a list of what I expected from my young charge (the one hanging off Starter Dog's ear) built upon my experiences with Starter Dog. I categorized and sorted, resorted and re-categorized until I had a Basic, an Intermediate and an Advanced Level, with each transitioning neatly into the next. I further broken the Basic down into three sub-levels, to make things more manageable. I then sat back and admired my handiwork. It wasn't perfect, of course, but at least it was a start. Now all I had to do was teach it. It's nearly two years later. My little student is almost grown up, no longer piddles on the floor, and hasn't tasted the furniture in ages. Starter Dog still has ears, albeit at times they seem a bit longer than they used to be. At some later date I stumbled across a wonderful, free, on-line training plan by Sue Ailsby and I've been happily working my way through its Levels. I think it fits well with my original curriculum - particularly the more scholarly aspects such as stay, retrieve, and attention. Despite my disparaging remarks about instructors, I do have one I hold in highest regard, and over many classes and she has taught this clueless owner much. But the joys and burdens of tuition of my still bright-eyed student remains with me. This year, I will continue working through our curriculum, revising as needed to meet my student's changing needs. My goals for 2010 are now in place and I plan on putting out a Weekly Worksheet to better stay the course. It's my responsibility to see that my student is properly educated, and if he isn't, there is no one to blame but myself. Oh, and Starter Dog? He's matured into the best dog a family could ask for. Happy days! Zachary stared at me for ten whole seconds on Friday! Woo Hoo!!! I’m sensing a lack of enthusiasm on your part. I know, ten seconds doesn’t sound very long, so what’s the big deal, right? Would it help if I said it was the last item left in Sue Ailsby’s Training Levels Two? How about if I added that it took us three weeks of training, ten video sessions, and over 900 seconds of video of him NOT looking at me for ten seconds in a row before I finally got those ten seconds? That despite a weeklong self-imposed moratorium I put on videoing part way through. It was just too depressing. It’s not that nothing was done during those minutes. Oh on… in fact, “doing” was sort of the problem. During that time he must have done a hundred sits and downs. He did a fair bit of spinning (both left and right) and even tried bowing. He is darn cute when he bows, but that was not what I wanted. All I wanted him to do was look at me – for ten seconds. We started out easy – with an eye flick toward me. Click. Treat. How hard could this be? I think we got to two seconds within a day or so, but that was it. As soon as we hit the two-second mark he was off doing something. He brought me toys, touched imaginary things on the ground, and tried to get me to play tug. After all, this was training time. The whole point was to DO something, right? So we started over with an eye flick, then one second, then two, and then he would start doing something again – maybe walk around a chair, bob his head, or nudge my hand with nose. At some point he gave up on me altogether and nudged the clicker in my hand. I’m convinced he was trying to make it click on his own. Perhaps he thought the click itself summoned the treats, or caused some cosmic trap door to open and release its bounty. He’s very into the magic of training. Never has so much been done when so little was required. In contrast, it took Beau about ten seconds to learn the task. Beau’s default behavior – what he does when he doesn’t know what else to do – is first to freeze, and then bark. Since he freezes for more than 10 seconds (just in case I change my mind and give him the cookies anyway) this was as easy skill to teach. I’d stand there and look at him. He’d freeze and look up at me (probably praying for cookies from heaven) and after ten seconds a click would occur, his prayers would be answered, and the cookies would fall. Beau could do this all day. Zachary’s default behavior is to lie down (so far so good) then sit up (not ideal, but not a problem so long as he is still looking at me) then lie down (we are now at the two second mark)… and then try everything else he can think of. He could have crammed every trick he knows into those ten seconds, and he knows a fair number of tricks. It was just beyond his comprehension that all I wanted him to do was nothing. We got there eventually; one second at a time, one day at a time, one week at a time, and I really think he has it down. I sure hope so. The next level requires him to look at me for triple that time. Thirty seconds - just think of all the things he could do. ... then it's on to Level Three! With the new year fast approaching, I've decided to work up my list of canine goals for the coming year. I'm hoping writing these here will help me measure and ultimately meet these goals, the way a scale helps a dieter measure and meet theirs. Of course, in this case the scale is set up in the town square... with a town crier announcing the results every time you step on. While I'm not naive enough to think that just writing these goals is enough to make them happen, I do hope that by publicly stating what I hope to accomplish, the desire to keep from looking like an idiot here will overwhelm my desire to keep from looking like an idiot where ever the road takes us during the year. Beau: Beau's goals are a little harder. Older and more mature, he is an easy going, patient, and loving member of the family. However, his problems with impulse control make him difficult to take places (picture 85lb of dog convinced that every stranger he meets is his Long Lost Best Friend) and his lack of interest in toys or food when out of the house makes working on it a challenge. Work on impulse control until we can take him on relaxing walks in local parks and scenic areas. 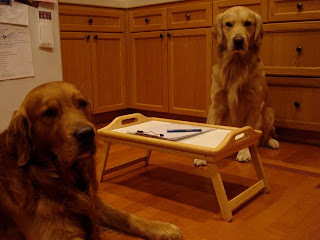 10-15 minutes working toward their goals, per dog, five times a week. Report back here once a week. A scale isn't any good if you don't step on it. Video progress whenever possible. Like that afore mentioned scale, the camera doesn't lie. They tried to slip "Skip the bi-weekly bath" in there, but I retain veto power and nixed it.